Azone Alice as The Cheshire Cat. Love the mittens and striped stockings! "Alice Time of Grace" wears a blue dress and a locket. Her shoes have tiny bows on them. 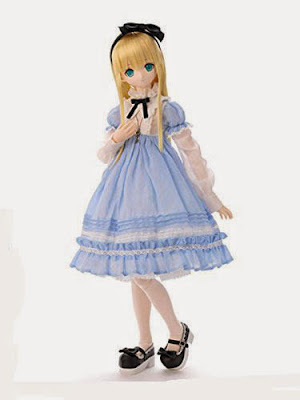 Azone's "Alice Cute Classic" wears striped stockings and lots of bows - on her dress, her shoes and her head. She carries a little stuffed White Rabbit. This is the "Tick Tock Rabbit" Alice doll from Azone. This one wears red shoes! Here are two dolls from the Azone Alice Mad Hatter tea party. The Black Alice doll comes with a black rabbit. And an eyepatch!